Harmony Hammond solo exhibition at Susan Vielmetter Los Angeles Projects, CA. Susanne Vielmetter Los Angeles Projects is pleased to announce an exhibition of new paintings by Harmony Hammond. Continuing Hammond’s decades-long engagement with materials and process to suggest content, the paintings in this exhibition come from two recent bodies of work: Bandaged Grids and Chenilles. Bandaged Grid #7 represents a transitional moment from minimal near-monochrome paintings of grids, while the off-white Chenille paintings, which incorporate rough burlap and grommets into Hammond’s signature layers of thick paint, suggest the soft texture and domestic warmth of cozy bedspreads. Chenille experts, like quilters, share an undervalued history of needlework and similar technique of puncturing fabric from the backside. 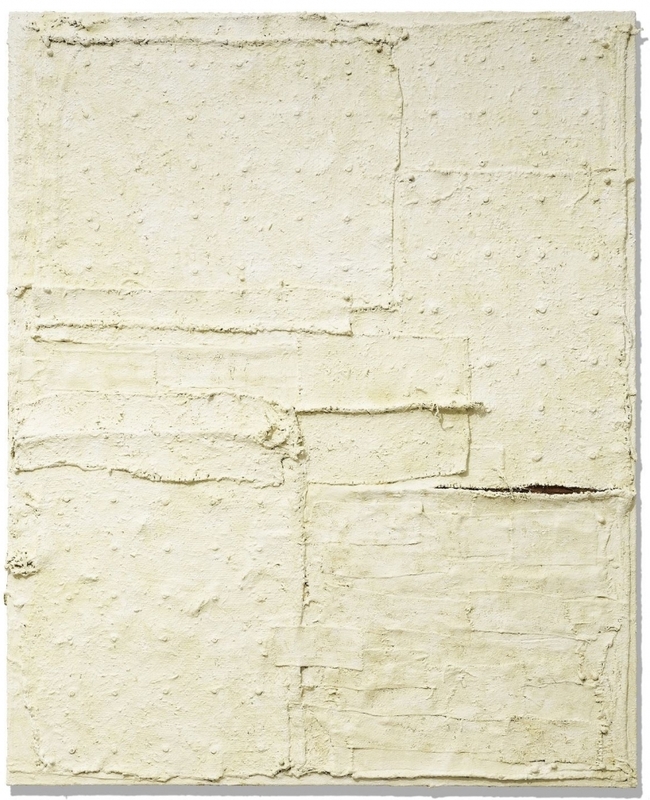 In Hammond’s pieced and layered paintings, the chenille reference is visual – performed by paint and other materials on the surface of the canvas, rather than the puncture of a needle and thread. The seams are important. There is a moment, in Bandaged Grid #7, where two edges meet as a highly articulated seam split open, disrupting the grid and the whiteness…a deep red is visible from some space inside the painting body. An orifice? A wound? A voice? An internal life? Color has agency: Refusing to be buried, it asserts itself from underneath and from behind. Deep browns and reds emerge through holes, at the seams, or cracks in the surface, at times bleeding into the paint to suggest the potential disruption of the warm white coverlet. The exhibition also includes several of Hammond’s “grommetypes” - monotypes on grommeted Twinrocker paper. At first glance, the grommetypes, like Hammond’s paintings, appear monochromatic, but their textured surfaces reveal a range of colors suggesting patinated metal or wood, rough skin, moss and lichens, galaxies, or topographical locations viewed up close. Based in Galisteo, NM since 1984, Hammond was a leading figure in the early days of the feminist art movement in New York in the 1970’s. She was a co-founder of A.I.R. (the first women’s cooperative gallery in New York) and of the quarterly Heresies: A Feminist Publication on Art and Politics. She curated numerous exhibitions and has lectured and published extensively on feminist, lesbian and queer art and the representation of difference. Her first book, Wrappings: Essays on Feminism, Art and the Martial Arts (1984) is considered a classic discussion on 70’s feminist art and her second book, the groundbreaking, award-winning Lesbian Art in America: A Contemporary History (2000), seventeen years later, remains the primary text on the subject. Hammond’s artwork has been exhibited nationally and internationally in venues such as the Museum of the City of New York (2016); Museum Brandhorst, Munich, Germany (2015); Rose Art Museum, Waltham, MA (2015); RedLine Art Space, Denver, CO (2014); National Museum of Women in the Arts, in Washington, D.C. (2011); MoMA PS1 (2008); Vancouver Art Gallery, Canada (2008); Museo de Arte Contemporaneo Internacional Rufino Tamayo, Mexico City (2007); Neue Galerie, Graz, Austria (2007); Museum of Contemporary Art, Los Angeles, CA (2007); SITE Santa Fe, NM (2002); Hammer Museum, Los Angeles, CA (1996); Brooklyn Museum, New York (1985); New Museum, New York (1982), Downtown Whitney Museum, New York (1978), Walker Art Center in Minneapolis, MN (1968); among others. Hammond’s work is in the permanent collections of the Metropolitan Museum of Art, the Museum of Modern Art, and the Brooklyn Museum, New York; the Walker Art Center, Minneapolis, MN; the Art Institute of Chicago, IL; the Phoenix Art Museum, AZ; and the New Mexico Museum of Arts, Santa Fe, NM; among others. This is Hammond’s first solo exhibition in Los Angeles. She is represented by Alexander Gray Associates in New York.